It is a week when records are broken, bonds severed and the best-laid plans are thrown out of the window. In no other sport and in no other country, does the business of strengthening a team become such a frenzied affair. But in England, the final week of the transfer window appears to induce panic and desperation as carefully conceived transfer strategies, quietly discussed over previous months, are turned upside-down. History tells us to expect transfer requests and scattergun raids and while on the face of it, the top sides in England are likely to be quiet, many others plan to do something. Manchester United manager Sir Alex Ferguson has often spoken of there being "no value" in the January transfer market. But while the league leaders sit pretty at the top of the table having agreed a deal for Wilfried Zaha, there are clubs who simply cannot afford not to act, as they either push for Champions League qualification, or because they require significant investment to ensure they remain in the Premier League. As the deadline approaches, clubs will wait and watch. Some will get themselves a bargain while others will pay the desperation premium that tends to enter the equation as the end of January approaches. Here, BBC Sport attempts to predict the most unpredictable week of the year with 10 moves that 'could' happen. PHILIPPE COUTINHO - Inter Milan to Liverpool or Southampton: The young Brazilian is likely to move to the Premier League in the coming days but his final destination remains undecided. Liverpool have made two bids (£6.7m and £8m) for the 20-year-old attacking midfield player, but Southampton have indicated to Inter, they are willing to pay £10m. Liverpool remain confident but Coutinho's relationship with new Saints manager Mauricio Pochettino, who he worked with at Espanyol, could be a factor. 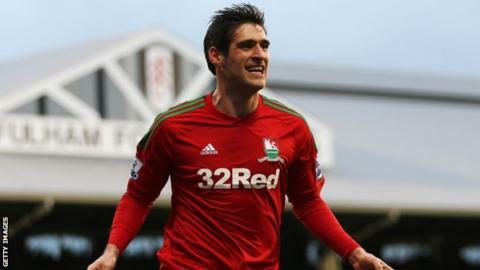 DANNY GRAHAM - Swansea to Sunderland: The boyhood Newcastle fan looks increasingly certain to end up on Wearside but much will depend on Swansea's attempts to recruit a replacement. Norwich made a bid, while Reading expressed an interest and while Graham was on Newcastle's long-list of striking options, he did not make the shortlist. The fee is likely to be between £4-5m and expect Graham to sign a three-and-a-half-year deal. KENWYNE JONES - Stoke to Swansea: This could be the deal that starts the merry-go-round and allows Graham to move north. But Stoke manager Tony Pulis will not allow the Trinidad & Tobago international to leave for much less than £5m and is willing to play hardball to ensure he gets the deal he wants. Stoke may in turn move to sign a replacement. MARIO BALOTELLI - Manchester City to AC Milan: The Italian striker could be on his way out of English football. Milan and City are in talks and if the Premier League champions can recoup close to the £23m they paid for Balotelli in 2010 a deal could be done. The player is understood to be open to the possibility, it will now come down to whether the clubs can reach agreement. TOM INCE - Blackpool to Liverpool or Swansea: Liverpool thought they had a deal in place before Christmas only for Blackpool to back away from the proposed agreement. January has proved something of a waiting game for both parties. Liverpool believe the player is worth £6m, Blackpool want closer to £8m. Liverpool won't pay over the odds, Blackpool won't sell the player for less than he is worth. Swansea are monitoring the situation but as the deadline approaches a deal could be done. Liverpool are prepared to wait until the summer, however. MOHAMED DIAME - West Ham to ??? : Arsenal have not, despite reports to the contrary, made an approach for Diame. The player has spoken of his intention to stay at West Ham and yet there is a suggestion that a move could happen in the final days of January. Well-placed sources at Upton park insist Diame's release clause is 'considerably higher' than the reported £3.5m. It is understood Arsenal, Aston Villa and Fulham have been offered the player by agents but none have expressed an interest. MARTIN OLSSON - Blackburn to QPR or West Ham: West Ham have made two bids for the Swedish left-back but have yet to meet Blackburn's valuation for the player. QPR have also expressed an interest and are actively pursuing a central defender or two. Both clubs are likely to test Rovers resolve. JACK BUTLAND - Birmingham to Fulham, Southampton, Liverpool or Everton: The parlous state of Birmingham City's finances was exposed in their latest accounts, which make clear the club's need to sell players. As the deadline approaches and the need for cash grows all the more important, the sale of the club's most saleable asset may become more likely. What started as a £10m asking price, has dropped gradually in recent months. The 19-year-old England goalkeeper, who has attracted interest from Fulham and Southampton and, more tentatively, Everton and Liverpool, could now be available for closer to £5m. GARY HOOPER - Celtic to Norwich: Neil Lennon has insisted Hooper will still be around to help with Celtic's Champions League ambitions but Norwich have made two bids for the SPL's top goalscorer and are likely to come back with a third. Having repeatedly rejected an offer of a new contract with Celtic, the pressure to cash in may become too much. PETER ODEMWINGIE - WBA to QPR: The Nigerian striker has been told that he will not be allowed to leave during the transfer window but QPR manager Harry Redknapp has not been put off. QPR have already had one offer of £2m rejected by WBA, but it is understood another offer is imminent. The player is understood to be open to all opportunities and handed in a transfer request which was rejected by the Baggies.